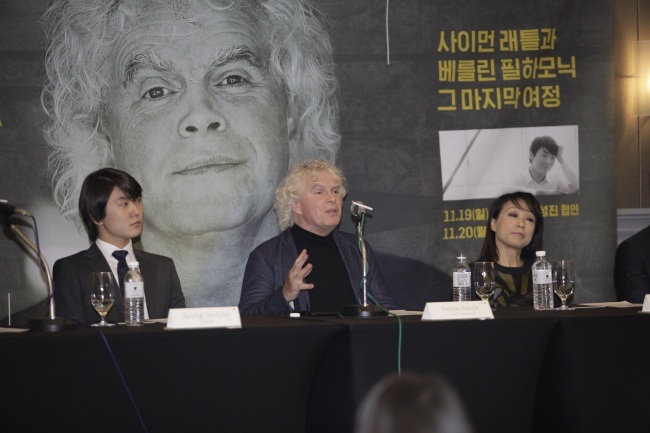 A few hours ahead of Sunday evening’s concert at the Seoul Arts Center, Simon Rattle, conductor of the Berlin Philharmonic Orchestra, was relaxed and effusive in his praise of pianist Cho Seong-jin, who would be performing Ravel’s Piano Concerto in G Major, M.83 with the orchestra. “This is a time when the planet is full of extraordinary young pianists. It is not rare. But what is rare is a poet on the keyboard,” said Rattle, adding, “But he is seated to my right,” as he looked at Cho. Last month, it was announced that Cho, the winner of the 2015 International Chopin Piano Competition, would be stepping in for Lang Lang for the Hong Kong and Seoul leg of Berlin Philharmonic Orchestra’s Asia tour as well as the Berlin and Frankfurt concerts that would kick off the tour. Lang Lang withdrew from the schedule due to an injury to his left arm. Remarking on pianist Krystian Zimerman’s recommendation of Cho, Rattle recalled how his longtime friend, known for being very critical of all pianists, including himself, had said Cho is a really great pianist. “He said I should hear him. I didn’t know how quickly I would hear him,” Rattle said. “Zimerman appreciates stillness, tranquility and introspective music,” said Rattle, observing that he could see how the renowned Polish pianist could have a brotherly feeling for Cho that transcends generations. While Sunday’s program was to include pieces that have been in the orchestra’s repertoire since its early days in the 19th century -- Richard Strauss’ “Don Juan,” Tone Poem for Orchestra, Op. 20 and Johannes Brahms’ Symphony No. 4 in E minor, Op. 98 -- the programming for Monday includes Sergei Rachmaninoff’s rarely performed Symphony No. 3 in A minor, Op. 44 and Igor Stravinsky’s “Petrushska,” along with the Korean premiere of composer Chin Un-suk’s “Choros Chordon” commissioned by the Berlin Philharmonic Foundation. Cho’s meteoritic rise in the world of classical music was not lost on the reporters or the pianist himself. Reminded of how he has fulfilled his two dreams -- performing with the Berlin Philharmonic which he did for the first time on Nov. 4, and holding a recital at the Carnegie Hall, which took place earlier this year -- at a relatively young age, Cho said that he also has dreams as a person and as a musician.